Fairy Godmother: Impossible? Bah, what's a fairy godmother for? Fairy Godmother: Not always. The sensible people will also say (sung) Fol-de-rol and fiddle dee dee and fiddley faddley foodle all the dreamers in the world are dizzy in the noodle. Fairy Godmother: Impossible for a plain yellow pumpkin to become a golden carriage. Impossible for a plain country bumpkin and a prince to join in marriage. And four white mice will never be four white hourses. Such fol-de-rol and fiddle dee dee of courses. Impossible! But the world is full of zanies and fools who don't believe in sensible rules and won't believe what sensible people say.. and because these daft and dewey eyed dopes keep building up impossible hopes impossible things are happening every day! Cinderella: And remember how very very hard I am wishing! Fairy Godmother: Impossible for a plain yellow pumpkin to become a golden carriage.. Impossible for a plain country bumpkin and a prince to join in marriage. And four white mice will never be four white horses..
Fairy Godmother: Such fol-de rol and fiddle dee dee of courses Impossible! Both: And because these daft and dewey eyed dopes keep building up impossible hopes impossible things are happening every day. Cinderella: Oh, oh, it is a golden coach, and four white horses and a coachman and a groom. Fairy Godmother: Oh dear of course how thoughtless of me. THERE!! Cinderella: Oh Fairy Godmother how beautiful!! I am dressed like a princess. Fairy Godmother: And here are your slippers. Fairy Godmother: Now! You are ready for the ball. But there is one thing you must remember. You must leave before the stroke of midnight, for the magic will last no longer. 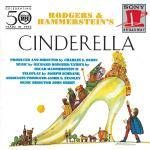 Cinderella: : I will remember. Oh fairy godmother how wonderful it all is!! Cinderella: It's possible for a plain yellow pumpkin to become a golden carriage. It's possible for a plain country bumpkin and a prince to join in marriage. Fairy Godmother: And four white mice are easily turned to horses Such fal de rah and fiddle dee dee of courses Quite possible!